Walls and ceilings of modern buildings are most often made of monolithic reinforced concrete slabs. 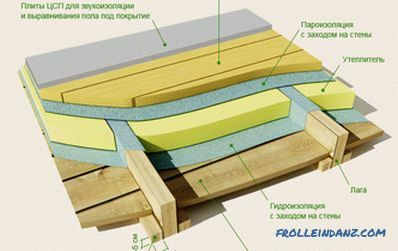 It is well known that concrete is a material of increased strength, the handling of which requires knowledge of its processing techniques. 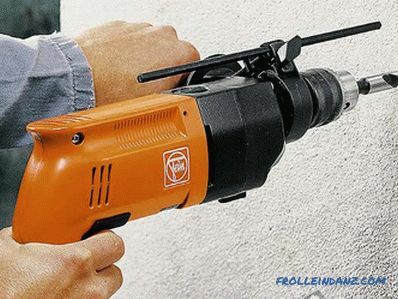 In particular, it is necessary to drill a concrete wall with a special tool: a drill or a perforator. A perforator or hammer drill provides a rotational-translational movement of the drill (drill), which greatly facilitates the drilling of concrete. Unambiguously select a punch if you need to make holes more than 12 cm in diameter. 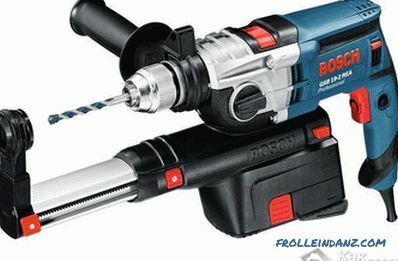 Some experts believe that in most everyday situations it is possible to get along with an ordinary drill that does not have a shock function. 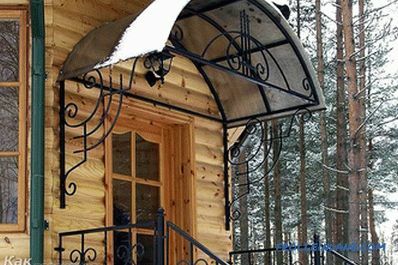 But in this case, for successful work, you will need to use a special metal pin, whose thickness is approximately equal to the diameter of the planned passage. Through this pin, they “fill” the point of the intended drilling and periodically break the concrete as it sinks into the wall. Several small holes can be drilled using a conventional drill with a pointy drill. The choice of accessories is of great importance. Pobeditovy tip has a T-shaped. 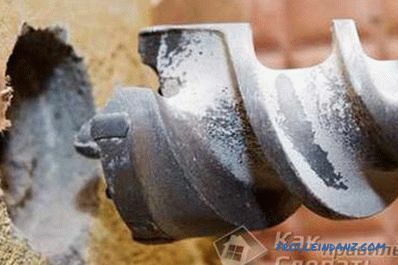 If you want to get a really durable tool, purchase domestic manufacturers of drills, where the ratio of metals is 9: 1, if you buy a drill made in China, you should know that there are less hard alloys there. Strength depends on the ratio of its diameter and length. There is a pattern: the longer the drill, the thicker it should be. Hardened drills have a black tint, gold color - titanium-coated drills. Titanium is much stronger. For a drill, choose drills with a shank in the form of a polyhedron or cylinder, for a punch - drills with marking SDS-plus, SDS-max. Drills for drills and perforators are not interchangeable: they can be installed on another tool only with an adapter. Auger Designed for making deep aisles. 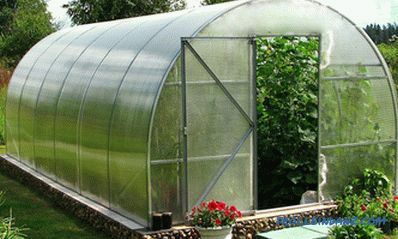 Their length can be up to 1 m.
Gentle Allows you to quickly create holes of small diameter. Spiral Used for drilling large diameter passages. But the fact is that with the help of the drill they make holes only up to 4 cm in diameter. For drilling larger passages in concrete, use concrete crowns for perforators with tipping from hard alloys. Their diameter is 35-120 mm. However, the most running are crowns with a diameter of 68 mm. They are ideal for creating holes for flush plates. There are commercially available extension cords that allow you to make holes deeper than 15 cm. If you are using a drill, then you should choose a tungsten carbide-coated crowns. The ability to work with such crowns is determined by the power of the drill. It should be more than 1000 watts. Drilling with crowns is performed with the hammer mode turned off. When working with an ordinary drill, you need to carefully ensure that the drill does not overheat, for which it is periodically cooled in cold water. After a slight penetration into the concrete, you should use the same pin that you need to enter into the recess and hit it several times with a hammer (with simultaneous rotation). Then “drill a little more” and repeat the same operations with the pin. Avoid overheating of low-power tools, take breaks in work every 15 minutes. 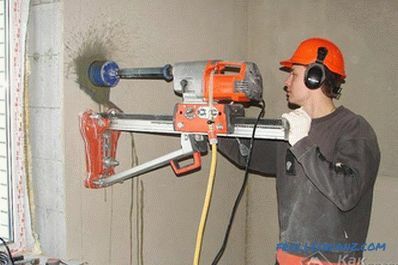 Before drilling a concrete wall, for example for a socket, it would not hurt to familiarize yourself with yet another effective method of making holes. It will be about the so-called diamond drilling, which allows you to cope with the task quickly and without dust.It should be warned that for this you will need special equipment, which is a set consisting of an electric motor, a stand fixed on the base, and a crown drill. The design of such an installation provides for the possibility of cooling the working tool by supplying water to the drilling site. At the same time, the water washes away the dust, and it does not have time to penetrate into the surrounding space. Using a special water vacuum cleaner, also included in the installation kit, the place of work is cleaned. 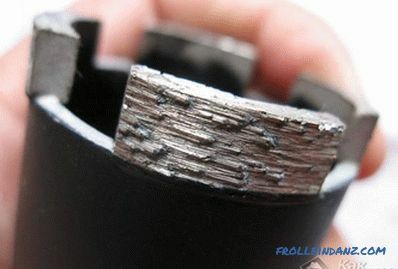 Before you start, check whether the drill is properly installed in the tool. If reinforcement is caught in the way, it should be drilled with a drill for metal or pierced with a punch. If the wall crumbles on the other side, slow down, and do the work on a reduced vibration mode. If a drill gets stuck, it should be drilled with a tool of smaller diameter, but not removed by loosening.